Teatro alla Scala was built from 1776 to 1778, following the destruction of the Regio Ducale Teatro (built 1717) that had formed part of Palazzo Reale in Piazza Duomo. Its construction was funded by the nobility of Milan, with the assent of Maria Teresa of Austria, who was empress of Austria and Duchess of Milan. The architect, Giuseppe Piermarini, designed a severe Neoclassical facade (which became a prototype for many other opera houses in Italy) and above all created an interior which from the start was exceptional as regards its acoustics. In 1943, the Allied air-raids seriously damaged the theatre, above all the stalls and boxes. Reconstruction aimed at reproducing the original visual effect, but certain aspects of construction, such as the use of concrete, marred the acoustics somewhat. The theatre reopened on 11th May 1946 with a concert conducted by Arturo Toscanini. 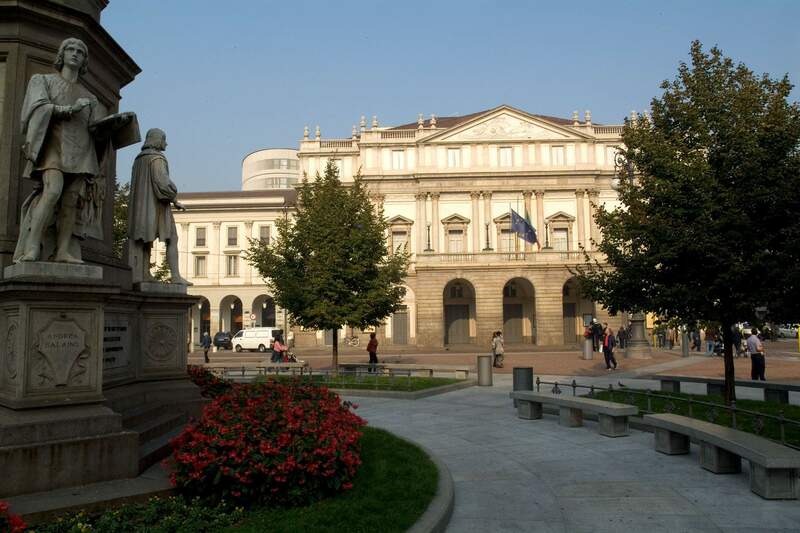 Just the name of Milan’s fabled opera-house conjures up the image of musical excellence. The theatre is so compact as to make the audience feel part of an exclusive club, particularly if you’re up in the gallery on a first night, along with the loggionisti. These are the opera fanatics who know the score bar by bar and who, while the high society and nouveau riche down below are politely applauding as the performers take their curtain calls, will be nodding approvingly, cheering, jeering or throwing crumpled programmes depending on their opinion of the soloists and director. The relationship between the loggionisti of La Scala and performers can be idyllic, as in the case of Maria Callas, or problematic in the extreme. Indeed, several world-renowned opera singers prefer not to sing at La Scala at all. Some of the noisier interventions from the galleries have gone down in history. One occurred at the first-night performance in 1972, when shouts and whistles of disapproval greeted Ballo in Maschera conducted by Gianandrea Gavazzeni. Things are not plain sailing after the prima, though. In 1970, at the end of the fourth performance of Vespri Siciliani, the soprano Renata Scotto was at the receiving end of what looked like a bouquet of roses. It was, in fact, a bunch of turnip-tops! No comment needed. Something of La Scala’s reputation is undoubtedly based on the loggionisti. Paolo Grasso, co-founder of Milan’s Piccolo Teatro, said that La Scala is like an oak tree, but with its roots at the top, referring to the cognoscenti in the gallery. The opera fanatics generally bought the cheapest tickets available, sold just before the performance and obtained at the cost of a long and uncomfortable wait in a queue. 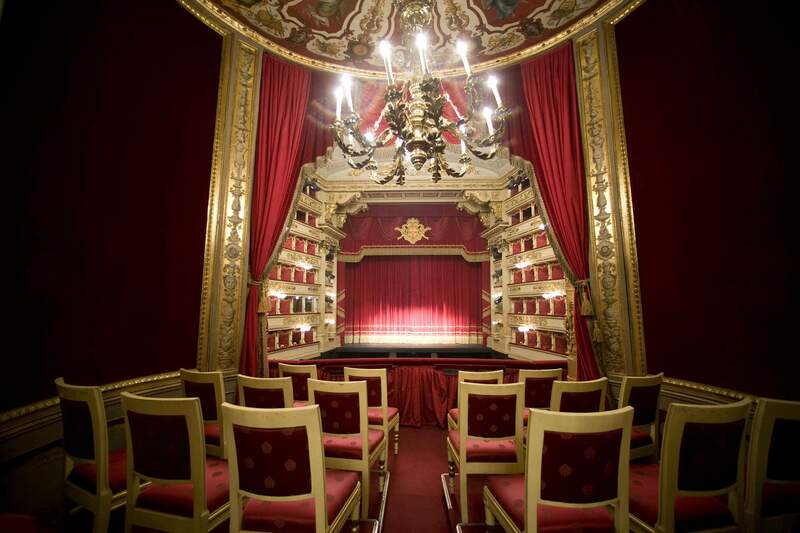 Now that Teatro alla Scala is being restored, these cheap tickets have been abolished. The opera fanatics voiced vigorous protests (comments expressed in letters sent to publications by the loggionisti association include “people are afraid of the judgement from the galleries… theatre management prefers a wealthier, less knowledgeable audience… they want to apply marketing and modern management methods, and the loggionisti don’t fit in with their plans…”). The season at La Scala always begins on the 7th December. This is the feastday of Sant’Ambrogio, the patron saint of Milan, and is a public holiday in this city. Tickets for this evening start are expensive and hard to get.